Visual design is an important component to creating an email that converts. What is good visual design? You want to not only include compelling images, but also make sure that your email is formatted properly. When an email comes into an inbox, a subscriber has to turn on the images so that they come through. The good news is that 55 percent of consumers surveyed by The Relevancy Group say that they turn on images in the emails they receive. The bad news? Many consumers don’t turn on their images. Your email should look appealing. Don’t use stock imagery if you can help it, and use imagery that is relevant to your audience. Take a look at the following figure for an example of clean design with good use of imagery. 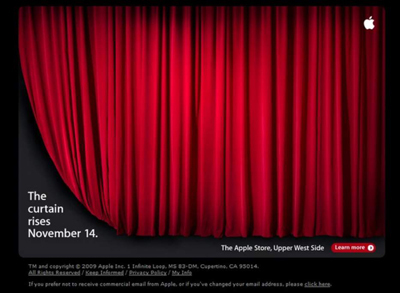 This is an email from Apple about a recent product launch. The email has little copy and a very simple design. But the design and the small amount of copy included truly say it all and intrigue the reader. 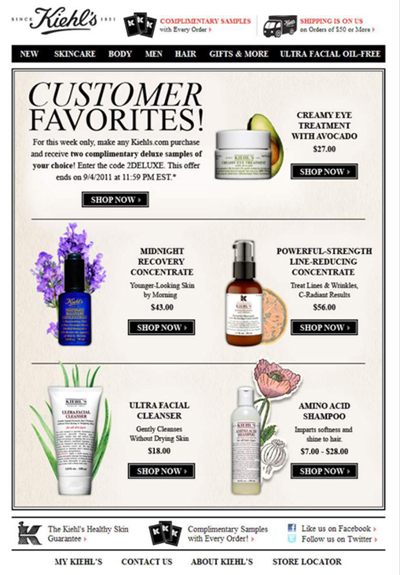 The figure below is an email from Kiehl’s. Note that they include copy asking the recipient to shop customer favorites with images of each product and Shop Now call-to-action (CTA) buttons. After you have your imagery in place, you need to make sure that you are optimizing your emails for those who do not have images turned on in their email program. A really cool way to do this is to create a download button that is not an image but is instead HTML code. 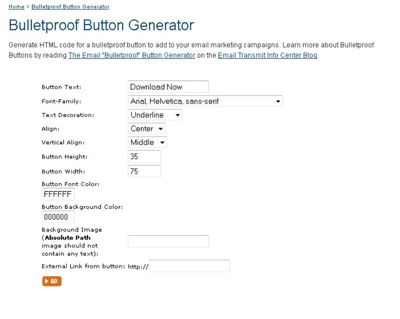 Try using a button generator such as the Bulletproof Button Generator at Email Transmit. You can go to the site, input your button text, format, button height, and width, and the site generates HTML code for you to input into your email. 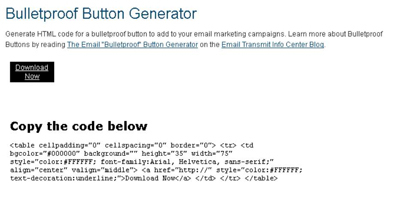 As you can see in the figure below, the HTML looks like a button, so it really pops. And voilà! You have a text-based button and some code you can input to generate a button, as seen in the following figure. Also make sure that you use image tags so that recipients who block images know what your email is about. For instance, if your email has a large image that reads $50 Visa Gift Card for a Demo, make sure your tag says it too. That way, even if your lead doesn’t see your image, she knows what the image conveys.